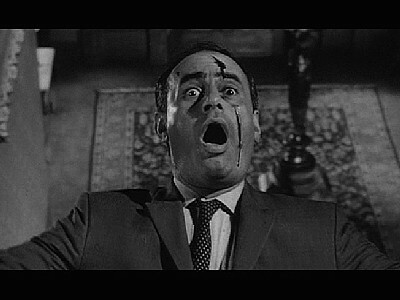 One of my favorite moments in any film is Norman Bates’s killing of detective Arbogast in Hitchcock’s Psycho. Those scenes culminate with a forced identification. Hitchcock’s camera angles transform the viewer into an undead bird. The film opens with an extended establishing shot. Viewers are made to feel like a bird soaring over San Fransisco and zeroing in on a window. Through the window a voluptuous, half-dressed blond woman converses with her half-dressed lover in a bedroom. At the outset, viewing is symbolized as flight, a bird-like activity. That’s harmless enough, thrilling even. We can fly at such moments of reckless viewing. Of course, the laws of gravity are only suspended for a price. The toll exacted is remitted in shame tinged with prurient, voyeuristic delight. And delight for using our new, filmically-enabled birdie superpowers not to protect the innocent or to save kittens trapped in trees but to play naughty peeping Toms–well, that in turn creates more potential for shame, and so spins Hitchcock’s spectator in a cycle of interest and desire, shame and dread. 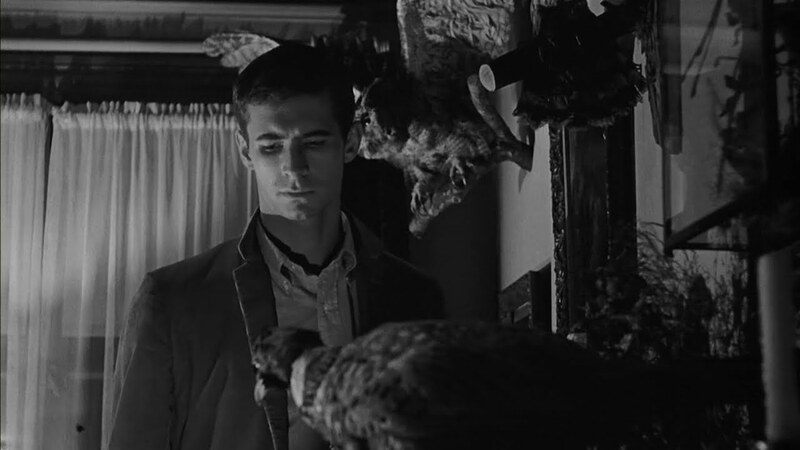 All of that birdwork really takes flight in the film’s metaphorizing of Norman’s favorite hobby, his taxidermy. All those beady-eyed birds of prey seem to watch us from ready mounts strewn about the Bates motel. We watch them. They watch us watching them. And Norman watches his blond, stalking her and looking at her and just waiting for the perfect moment to pounce. During these scenes, Hitchcock piles onto Norman all the perversion that his plumaged set of images can convey. It’s a feathering that’s tarred 24 times per second. In the process, we as spectators feel somewhat comfortable in our voyeuristic pursuits of love and death along the interstate, where hospitality is only a knife and a cross-dressing shower scene away from being downright cozy. We feel comfortable because all the weirdness concentrates onto Norman. 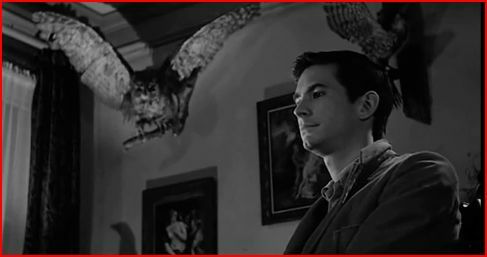 The uncanny congeals onto Norman Bates like so many glued feathers plucked upright on the comb of a falcon propped just so to squawk in death. It and he, a dumb show of angry predation, but not for long–as though nature red in beak and talon could be freeze-framed in a corner for our safe and distant scrutinizing. Things change when the detective enters the picture, literally. We wonder if the film is going to take the conventional course. Hasn’t the detective brought all of society’s authority with him, annealed into his badge and gun? We assume that the jig is up. Now our viewing will have to shift. We will watch as this detective determines Norman to be the killer, giving chase as the psycho flees. But that’s not what happens. Rather, what Hitchcock shows happening is, indeed, one of the technical highlights of the film. And this brings us to a veritable rule of Hitchcock spectatorship–whatever the technical innovation is for the film, there lies the ideological kernel as well. For this film, it is the uncut scenes of Arbogast falling down all those stairs he just cautiously walked up, the knife cuts inflicted by a now matronly Norman freshly weeping blood as Arbogast flails back down the steps to his death. That part is not what interests me, however. Neither is this part what culminates the bird imagery that comes before. Our stakes at this precise moment are psychologically low. We can enjoy this scene of a flailing man as we fly towards his face down those stairs. In fact, I’ve shown this film to many who’ve never seen it before and it is not uncommon for even the most serious among them to chuckle a little at the dated effects of this exercise in close-up action. 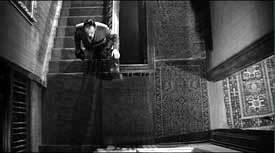 The part that continues to resonate, by contrast, is the scene just prior to Arbogast’s stabbing, after he climbs the stairs and reaches the landing. Throughout the film, Hitchcock has shown us birds stuffed in corners. We see them on their perches staring out beyond the artificial sheen reflected in their glass eyes. But here, all of a sudden, when Arbogast reaches the top of the landing Hitchcock doesn’t just show us the stuffed birds perched there in the ceiling corners. He turns us into those birds. As viewers we are made to uncomfortably occupy the same viewing position as Norman’s stuffed birds. We watch from our dead perch to look down on the morbid actions about to occur. And when it happens we are as removed from the action in our movie theatre seats as a dead bird would be for the scene taking place below it. The transformation is uncanny and unsettling, to say the least, to be equated to an undead bird of prey. “Only a dead bird cannot see.” You might here object. “What kind of dead bird is still allowed to see, to see only, but not act?” You ask. The kind that is the movie spectactor is this scene’s dangerous reply. Hitchcock was a genius, an absolute genius. As I tend to get to things late I actually only saw Physco about a month ago for my very first time but it didn’t disappoint for all the reasons you have pointed out above. And to be honest, I possibly should have been disappointed, listening to the rave reviews, peoples opinions etc for about ten years or more before sitting down to watch it. Pure genius. Rope is another one of my favourites, we the audience, watching that chest, screaming at James Stewart character. Did I mention, Hitchcock was a genius?! Rope is an amazing performance–theatre on film and weirdly up close. Hmm, at some level I’m not happy to be equated with voyeuristic dead birds. And here I thought I liked Hitch. Must admit my eyes are sometimes glassy.